A beautiful larger sized 15 year old twisty bonsai which has wonderful seasonal leaf colour & pretty purple fruits as it matures. The ceramic drip tray and care instructions are included. Potted into a mid blue ceramic bonsai pot. Ideal for beginners. This is an absolutely stunning indoor bonsai tree with incredible structure and s-shaped trunk. 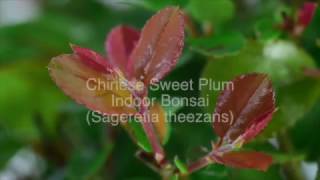 The Sweet Plum (Sageretia theezans) indoor bonsai symbolises protection, creatativity, new life & warm wishes. This bonsai would make a lovely gift. A beautiful indoor bonsai tree with S-Shaped trunk potted into a blue ceramic bonsai pot. The drip tray is also included. Just to say the Bonsai tree that I ordered from you yesterday has arrived safe and sound. The tree is beautiful and it is hard to believe it has been through the post as it is perfect condition.. Thank you, I was feeling very apprehensive about ordering online with you and felt sure that I was going to get something not quite as good as expected - but quite the opposite - I’m thrilled! Just to say thank you, the bonsai is absolutely beautiful and Neal is thrilled. I've never ordered from you before but I will recommend you to others. Great service.